Intertax has noticed that many sellers in case of small and not important adjustments on the sales invoice such as wrong address, dates, invoice number, etc., often issue a credit note and then rise a new invoice that includes all proper data. Such procedure may result in huge negative consequences as the credit notes that decrease the output VAT may be declared in the VAT return only after meeting all obligatory requirements for credit notes. In case meeting those requirements fails, this procedure may lead to temporary double VAT taxation of the transaction. E. If the price was increased or a mistake was found in the price, VAT rate, VAT amount. F. in case of any other mistake (less important mistakes). 2. Correction Note (in Polish: NOTA KORYGUJĄCA), in case the mistake refers to item F only and has been noticed by the customer. Both documents may be issued only by sellers. Bearing in mind that according to Polish VAT Act, in case of any decreases of the tax base the possession of confirmations of the receipt of the Credit Notes by the buyer, with a few exceptions that have been listed in section IV is obligatory, issuing corrections in the form of the Simplified Correction is an advantage. This is due to the fact that Simplified corrections do not include decreases of tax base, there is no necessity of obtaining the confirmation of receipt of the correction by the buyer. The sufficient is that document has been sent to him. Depending on the type of document (credit note / debit note) there are different requirements for declaring it in Polish VAT return. According to Polish VAT law, in case of the reduction of tax base in relation to the basis specified in the VAT invoice that was previously issued, the reduction shall be declared on the condition of possessing by the seller a confirmation of receipt of the correcting invoice by the buyer of the good or service recipient for whom the invoice has been issued. The confirmation should be obtained by the seller before the deadline for filing a tax return for a given billing period in which the purchaser or customer received a correcting invoice. 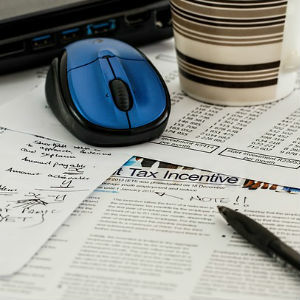 Obtaining confirmation of receipt of the correcting invoice by the purchaser of the goods or services after the date of submitting the VAT return for a given settlement period entitles the taxpayer to include the correcting invoice for the settlement period in which the confirmation was obtained. The above means that the seller has no right to decrease the amount of output VAT based on the issued credit note until he receives the confirmation of receipt of the credit note by its customer. Since the Polish VAT act does not specify how the confirmation of the receipt of the credit note should be delivered, it is acknowledged that it may be done in various ways such as: mail confirmation, email confirmation, fax confirmation, information left in the seller’s IT system, etc. In case the seller does not possess a confirmation of the receipt of the issued credit note, but can prove that he tried to deliver the credit note to the customer, he is allowed to decrease the output VAT provided that, based on the documentation held, it is apparent that the customer knows that the transaction has been carried out in accordance with the conditions set out in the correcting invoice. What is very important, there is no legal concept of rebilling in Poland. By “the rebilling”, we understand the issuance of the credit note “zeroing” the amounts, which actually cancels the invoice that was previously received by the customer and issuance of the new invoice with correct amounts. Please be advised that in case of lack of confirmation of receipt of the credit note by a customer, the rebilling of invoices may lead to temporary double VAT taxation of the same transaction. 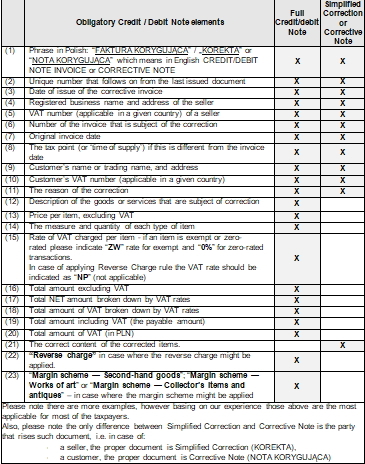 Based on the Polish VAT rules, there is no special requirements on declaring debit notes unless they were issued based on the rebilling procedure (credit note to zero and new invoice with the correct amount), so the seller should focus on credit notes only. shall be treated as not important mistakes. Taking into consideration that in many cases the mistakes are not treated as important, the seller should issue only a simplified correction instead of full Credit Note. The main advantage of this is lack of obligation of possessing the confirmation of receipt of the credit note by the customer, which excludes the possibility of temporary double VAT taxation of the transaction. The above is crucial, as starting from January 2018 all entities will be obliged to file SAF-T reports, which include data about all sales and purchase invoices. Considering this, the tax office will have chance to check if all the transactions between the taxpayers have been declared, and in case of credit notes, will be able to easily check if the credit notes meet all the requirements enabling the seller to include them in the VAT reporting. It is obvious that in case meeting of the requirements for declaring the credit notes fails, the tax office will exclude them from VAT reports and will demand the seller to pay the outstanding output VAT with interest. In a such situation, the seller will be temporary obliged to pay the VAT twice which influences his cashflow. For instance, in case of issuance an invoice 20, and then a Credit Note to invoice no. 21 as a cancelation of the invoice no. 20, and then issuance of the new invoice no. 22, and not meeting the requirements for declaring the credit note, the taxpayer will be obliged to declare the whole VAT charged on the invoice 20 and 22, while declaring the credit note will be possible only in the VAT return in the month in which the requirements has been met. Taking into consideration the above as well as possible sanctions for incorrect settlements, it seems very important to seller to consider changing the procedures of corrections of the sales invoices. ← Proposal to introduce more flexibility for Member States to change the VAT rates they apply to different products.